Earlier this week in the popular recurring segment, "Where in the World Is Matt Lauer?," the NBC Today host schussed down the desert dunes of Namibia on skis. His graceful run made for good television, indeed, but in Namibia – as well as in Brazil, Chile, Peru, and other parts of Africa – sand-skiing and sandboarding are real-deal pastimes that have been gaining popularity in recent years. Following in Lauer’s footsteps, er, ski tracks, takes a bit of effort, however. Unlike their cold-weather counterparts, sandboarding and sand-skiing don’t have an entire industry of package tour providers dedicated to them. Adventurers interested in trying them out will have to arrange a side excursion from an existing itinerary. But it's a worthwhile effort – and one that makes for some great photo opps. One trip that makes it possible is the Spectacular Namibia tour offered by New York-based operator Extraordinary Journeys Africa, run by a mother-and-daughter team well-versed in Africa after having lived and worked there for years. The six-night tour starts at $1,170 per person, including accommodations, meals, and two camp activities per day. The excursion begins with two nights at the luxurious Kulala Desert Lodge (or, depending on the dates of your trip, the Kulala Wilderness Camp), which has private access to the iconic dunes of a region known as Sossusvlei. Its breathtaking red sand dunes are believed to be the highest in the world – Big Daddy, the tallest, reaches about 1,070 feet, and yes, you can climb to the very top for some spectacular bragging-rights photos. 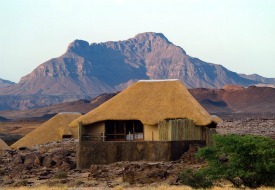 After your cranial orifices have had their fill of sand, it’s on to Doro Nawas in Damaraland (pictured here at left), with starkly beautiful vistas and desert-adapted wildlife, and then Etosha and the Etosha National Park, which is renowned for its large herds of game and – if you can stomach the rawness of it – excellent predator viewing. Note that the rate of $1,170 per person is valid through January 6, 2012, and increases slightly throughout the rest of 2012. The best savings come for groups of four or five, since you can share the rental car cost to drive between each destination (though a pretty-penny flight option is also available, starting at $3,275 per person). Ground transfers by car entail about five hours on gravel roads, but the scenery is spectacular. For more information, visit www.ejafrica.com. To start planning your trip, see our Namibia travel coverage, and then check out our Sports and Adventure Travel Deals.